My name is Lee Woods and I had my Gastric Sleeve procedure in March 2018 at the age of 32 and I can safely say it was the best choice I have ever made. I have struggled with my weight all my life. I was always the kid in school who was a ‘bit chubby’ but still quite active and played football 3 or 4 times a week, then in my 20s the care free lifestyle of alcohol and fast food coupled with a serious knee injury sustained playing football, my weight just continued to pile on. 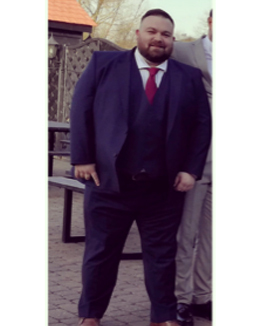 I was 30 when I noticed how big I had actually got, I was over 22 stone and becoming dangerously overweight, I had a few health issues which included Sleep apnoea and Stage 2 Hypertension and the worst thing was I couldn’t see any way out – exercise was a total struggle as I was just to unfit. My motivation was non-existent and all I wanted to do when I got home from work was either lay on the sofa, order a takeaway or sleep! Clothing was becoming as issue – I could only order clothes online from the old faithful ‘Jacamo’ as clothes straight off the rack were too small and even walking my dog around the block was making my back hurt – so I would have to sit down. I was 31 when I made the decision to have the surgery. 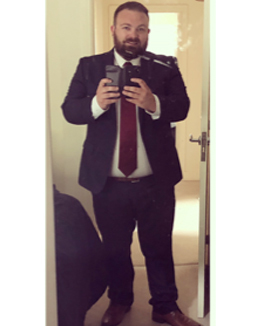 It was just after the summer of 2017, I weighed just shy of 24 stone- I knew I needed to do something and that was when I almost got the gastric band fitted- but was advised against it last minute and I am so glad I did as I now know that the band was not the best choice for my lifestyle. I got in touch with NOSC who were helpful and understanding and advised me of the sleeve procedure – I had my consultation with Mr El- Hasani a few weeks later and from that moment I knew it was the right thing to do and I just couldn’t wait for the procedure date to come around. I booked the surgery in December 2017 and waited until the March 2018 so I could have the recovery time off of work. The NOSC were so helpful- every step of the way, they were contacting me and ensuring I was mentally prepared for my pre- op diet and offered me all the support I needed. The day of the surgery arrived and yes, I was nervous but I was excited to start my new life. The recovery period was as expected, sore for a couple of days – but after about a week the discomfort was subsiding. I could only eat soup and broth for a couple of weeks after but then after four weeks I started introducing solid foods and I’ve never looked back. My recovery was great! Five months out and I can tolerate all foods with no issues- the food I no longer eat that I used to love includes bread and pasta but I really don’t miss those, it’s all about making good lifestyle choices and for me that’s the key. Five months post op including my three week pre op diet and I have lost 9 stone! I feel active, healthy and no longer have the health issues I started with and most of all, I’m the happiest I have felt in years. My goal is to lose 12 stone in total so there is still some way to go but I’m definitely going to achieve my goal! I use the gym 4/5 times a week and eat healthily- whilst still enjoying the occasional beer, I definitely have control now which I didn’t have before my procedure. I am so pleased that I chose NOSC and the support they have offered me has been great all the way through, so I would strongly recommend them to anyone considering weight loss surgery. And the only regret I do have is that I wish I had done this sooner.